Bullfrog Spas of OKC sells the most eco-friendly & energy efficient hot tubs on the market today. Featuring full foam insulation and wood-free construction. Each spa is built using systems, materials and technologies that are energy efficient and eco-friendly. The EnduraFrame™ spa structure and spa base are made from ABS molded composite material instead of non-renewable wood. The spa is supported by injection-molded ABS EnduraBeams™, and the cabinet is finished with maintenance-free synthetic EternaWood™. Many years from now your spa will still be used and not in a landfill because the JetPak® Therapy System makes Bullfrog Spas upgradable and it is easy to replace individual parts. Each Bullfrog Spas is made from 25% recycled ABS plastic materials. Any excess ABS produced during manufacturing is recycled and reused. No hazardous pollutants are released into our environment during hot tub production. The spa shell backing material is not fiberglass and is VOC-free. All Bullfrog Spas that you will find in our Oklahoma City showroom meet or exceed energy efficiency standards – saving you money, while protecting our planet. Our hot tubs simply don’t waste energy. Data compiled by the California Energy Commission outlines that Bullfrog Spas are the most energy efficient hot tubs in their class and are at least in the top 5 in every category in which we produce a spa model. Furthermore, energy efficiency heat is locked inside each Bullfrog Spa with full-foam insulation recycling heat in the spa because the JetPak® is submerged in the hot water. Bullfrog’s full-foam design insulates the spa completely to prevent heat escape. 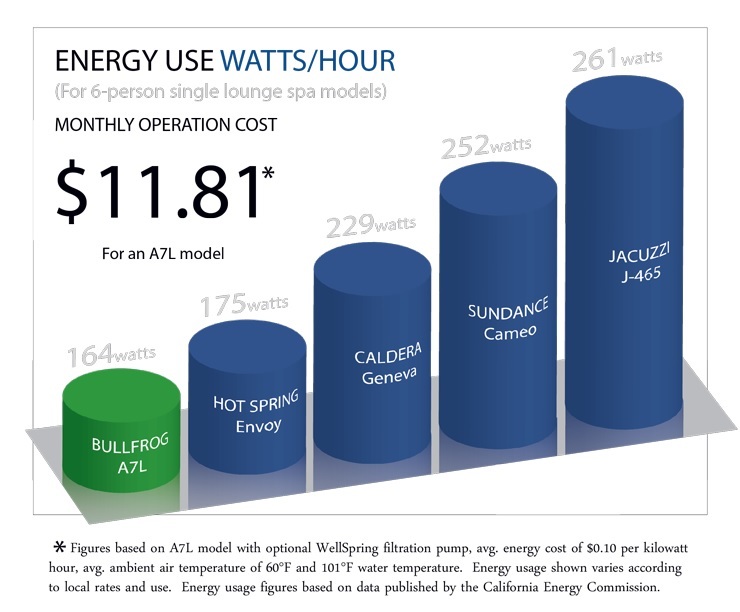 Every single Bullfrog Spa model meets or exceeds the stringent energy guidelines of the California Energy Commission. With the superior energy efficiency, you can spend the energy savings on other things. A Conventional Hot Tub on the left lets heat escape. The Bullfrog Spa on the right keeps heat inside the spa. Bullfrog Spas utilize a patented water delivery design with up to 90% less plumbing, full foam, and more efficient equipment to save energy and ensure that you can relax without worry. Less plumbing equals less energy used to get water to the jets. Most of the water delivery system in a Bullfrog Spa is inside of the proprietary H2Air Manifold on the JetPaks® and is submerged in the hot water. Any heat from water in the manifold transfers directly to the spa water instead of being lost to the exterior environment. This patented energy-saving feature keeps electric bills low and will keep you relaxed and worry free! Contact us today to learn more about how Bullfrog Spa is the greenest hot tub on the planet. Rest assured that you and your spa are environmentally responsible. Bullfrog International, LC is the parent company of the Bullfrog Spas® hot tub brand. Bullfrog International designs and manufactures the world’s only luxury hot tubs with the patented JetPak Therapy System™.